One of the major objectives of tax treaties has been the avoidance of international double taxation. This is generally accomplished through the agreement of each country to limit, in specified situations set out in double tax treaties, its right to tax income earned from its territory by residents of another country. The OECD Model Tax Treaty, other model conventions, and the bilateral treaties drafted in accordance with these models, allocate the taxing rights between the state of source and the state of residence. The source rules for income taxation are determined by Articles 6 through 21 of the OECD Model Convention. These rules are the product of a rather long history and it seems difficult to justify the scope of some in today’s world. Courts, tax administrators, and practitioners are confronted with a growing number of interpretation and application problems. In a globalized world with ever-increasing cross-border streams of income such problems command more and more attention. 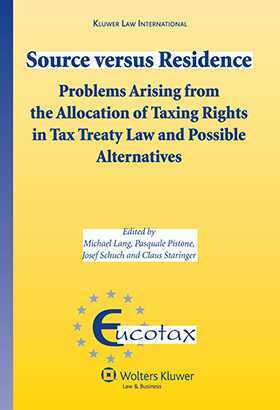 This book is designed to analyze the allocation rules of the OECD Model Tax Convention and its equivalents in bilateral tax treaties. The distinguished contributors to the work examine the justification for these rules - as well as their scope – and highlight the most relevant interpretation and attendant application problems. In addition they’ll suggest how such rules should be modified and examine possible alternatives.